Formerly the Western Meeting, the Ayr Gold Cup Festival is staged annually at Ayr Racecourse, in south-west Scotland, on the shores of the Firth of Clyde, in September. It is, in fact, the most valuable Flat racing meeting staged in Scotland and takes its name from the feature race, which is run on the third, and final, day. 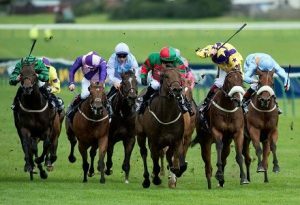 The Ayr Gold Cup, run over 6 furlongs, was first staged in its current guise in 1908 and, nowadays, is one of the major sprint handicaps in Europe. Unsurprisingly, the race regularly attracts numerous high-quality entries from both sides of the Irish Sea, but the safety limit at Ayr is just 25. Consequently, the Ayr Gold Cup is always vastly oversubscribed, so much so that entries for the race are accepted on the understanding that, at the 48-hour declaration stage, connections may nominate their horse(s) for entry to the primary consolation race, the Ayr Silver Cup, or the secondary consolation race, the Ayr Bronze Cup. The Ayr Bronze Cup, which was inaugurated in 2009, takes place on the middle day of the three-day Festival, a.k.a. Ladies Day, while the Ayr Silver Cup, which was inaugurated in 1992, takes place on the final day, as a precursor to the Ayr Gold Cup itself. Fittingly, the total prize money on offer increases, incrementally, from £30,000 for the Ayr Bronze Cup to £60,000 for the Ayr Silver Cup to £200,000 for the Ayr Gold Cup. Of course, the Ayr Gold Cup Festival is not just about major sprint handicaps. The highlight of the opening day is the Doonside Cup, a Listed contest run over 1 mile 2 furlongs and worth £65,000 in total prize money. Between the Ayr Silver Cup and the Ayr Gold Cup, the Firth of Clyde Stakes, which was elevated to Group 3 status in 2004 and is the only Pattern race run in Scotland, is also run on the straight 6-furlong course, but is restricted to two-year-old fillies only.